Update 5 p.m. PDT Friday: Some source code digging as revealed some features of Twitter's music app (yes, it's an app, according to the code). You can get the full breadth over at sefsar.com, but know that it looks like users will be able to connect with Spotify, Rdio, iTunes, SoundCloud, Vevo and YouTube. Users will be able to follow other users, listen to explicit tracks and compose tweets from the app, plus a few other goodies. Update 11:30 a.m. PDT Friday: The "Invite only" message on the site has been changed to "Coming soon," hinting that Twitter Music is imminently launching. Another clue to what Twitter has in store was picked up by The Verge: It appears as though Stephen Phillips, founder of the recently acquired We Are Hunted, has been tweeting songs via something called "Trending Music Web." The links tie to tracks from SoundCloud and Rdio, hinting that these may be part of the Twitter Music service. We should know more before long. It's here! Twitter Music is here! OK, we'll qualify those exclamations: A music.twitter.com website is up, and it's completely useless. The site is nothing more than a swath of black with a blue birdie and "#music" in the middle. So far it's invitation only, and clicking the sign in button will redirect you "back to the application," a.k.a. the site. What's more, AllThingsD is reporting that although the app is available now, it's only in the hands of a select few "influencers," like one Ryan Seacrest. The rest of us, it sounds like, will have to wait until next week to utilize what's said to be an iOS app. 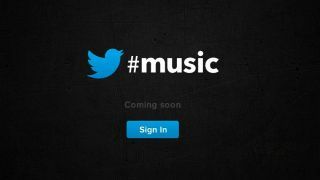 Twitter confirmed Thursday that it picked up social music discovery site We Are Hunted, stoking the fire that the company was working on a standalone music app that, among other features, makes track and artist suggestions based on the Twitter accounts a user follows. Right around the time the announcement broke, the host of "American Idol" said "yes, it's real" in a tweet about Twitter's music app. Later still, AllThingsD reported the app would launch Friday or over the weekend during the desert-based Coachella music festival. All in all, it sounds like celebrities with access to the app will be talking it up as they wander around Coachella or wherever, creating a bunch of buzz before a public release. We've asked Twitter for more on the site and its music app aspirations, but all the company is willing to share now are the announcements on the We Are Hunted acquisition. Apparently it's quite proud of it. We'll keep on top of all Twitter Music developments, so check back in for more on whatever it is Twitter has ticking.